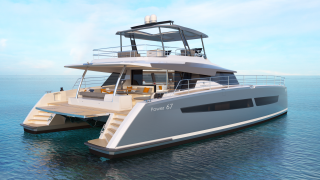 The POWER 67 combines all the strengths of a power catamaran with Fountaine Pajot’s extensive experience producing award-winning motor yacht and luxury catamarans. 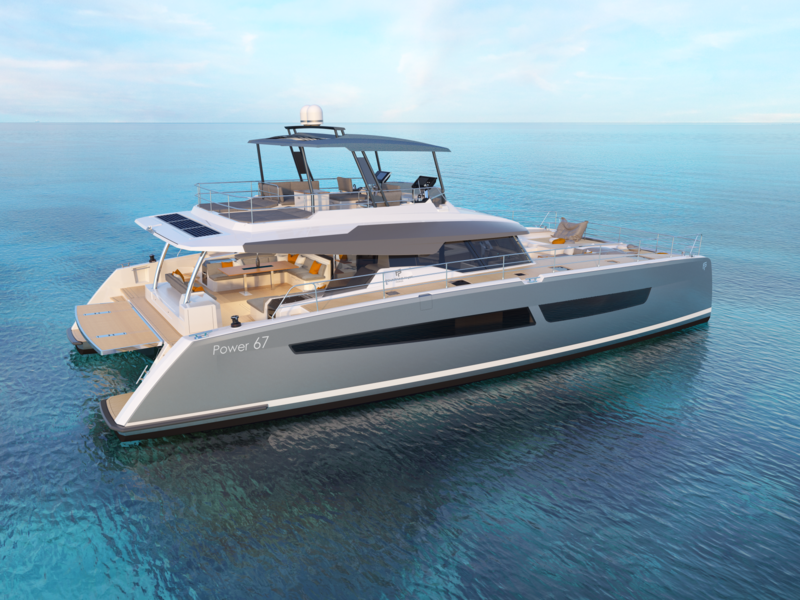 The Power 67 is the Flagship model of Fountaine Pajot’s Motor Yacht range and boasts all the signature features of the shipyard’s highly acclaimed lineup, yet has also inherited the luxury, space and elegance of the stunning Alegria 67 sailing catamaran. The Power 67 is designed for long distance sailing… Her power, combined with her hull design, allows her to reach incredible cruising speeds. 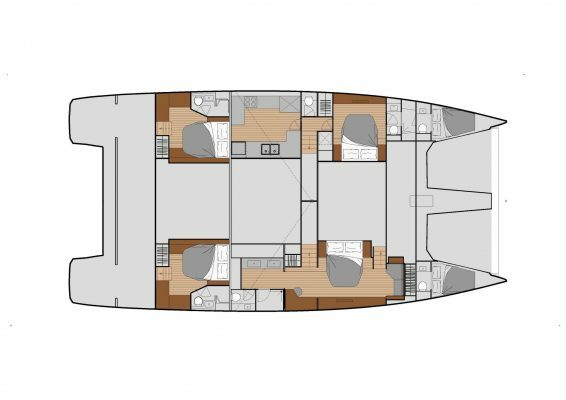 The long-range cruiser offers large tank capacity and autonomy to take full advantage of all the pleasures of navigation. 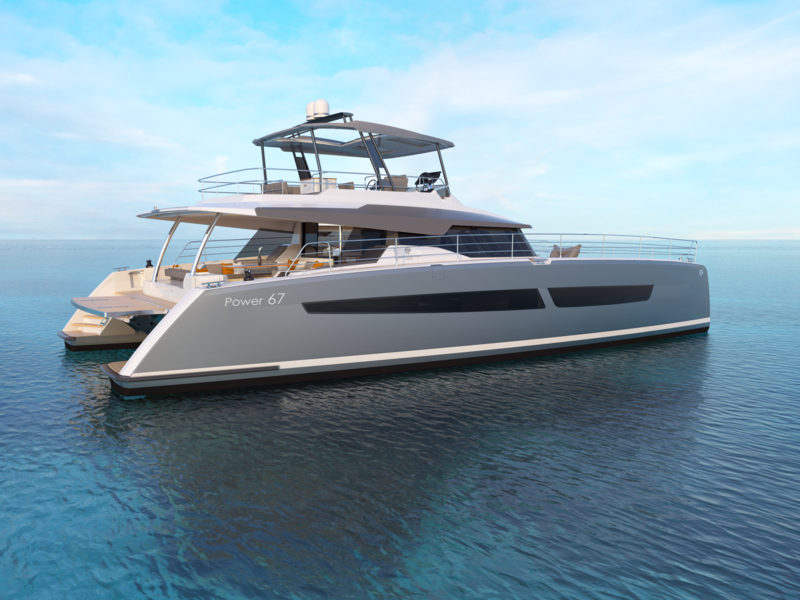 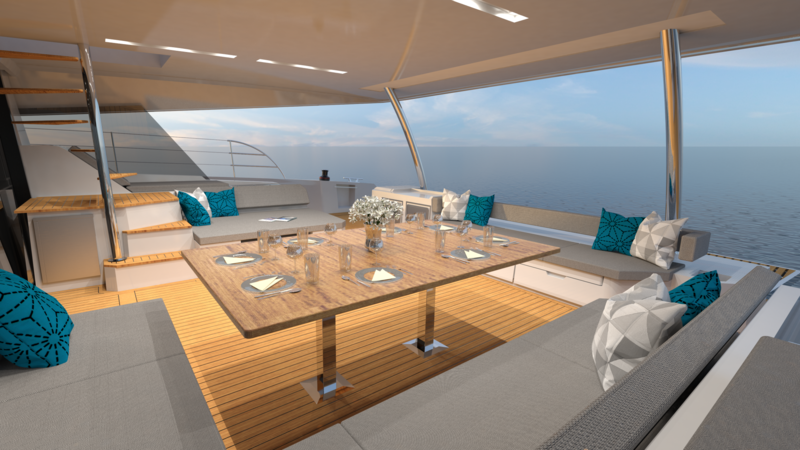 The Power 67 is synonymous with uncompromising luxury where space and comfort equate with elegance and dynamic vision. 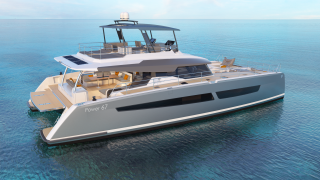 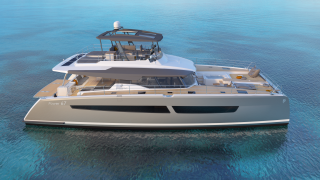 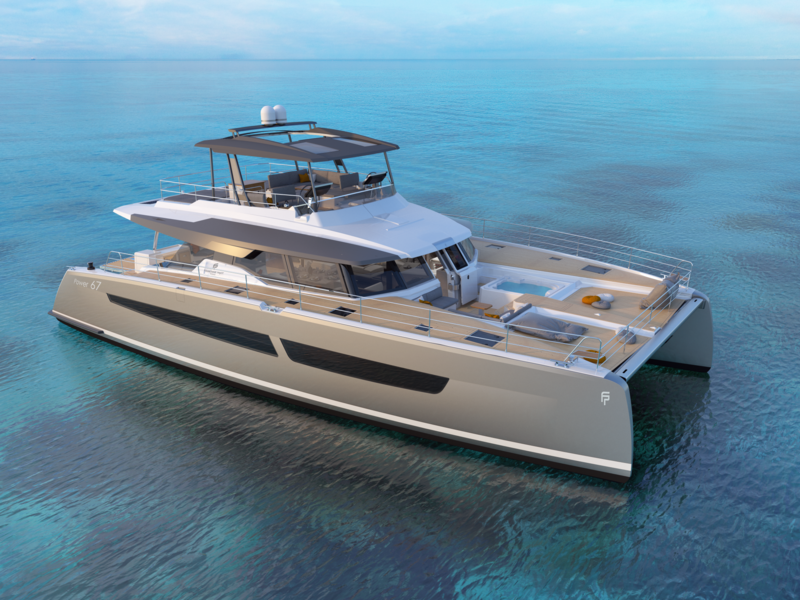 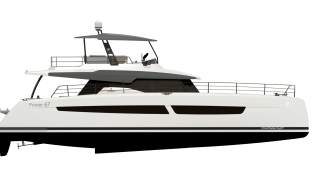 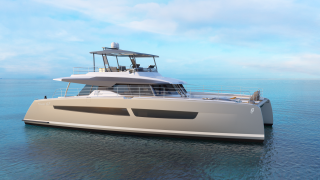 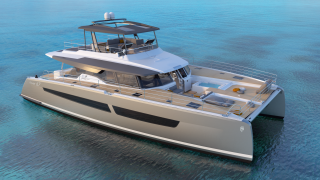 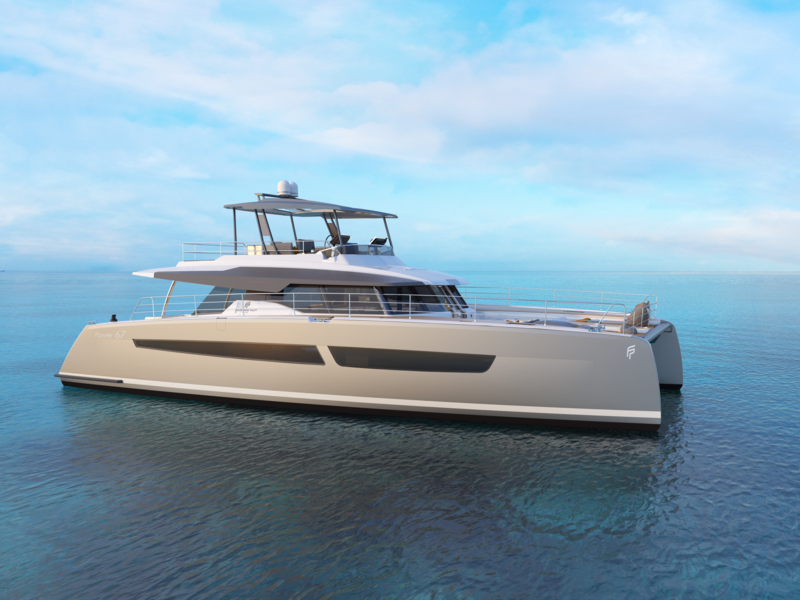 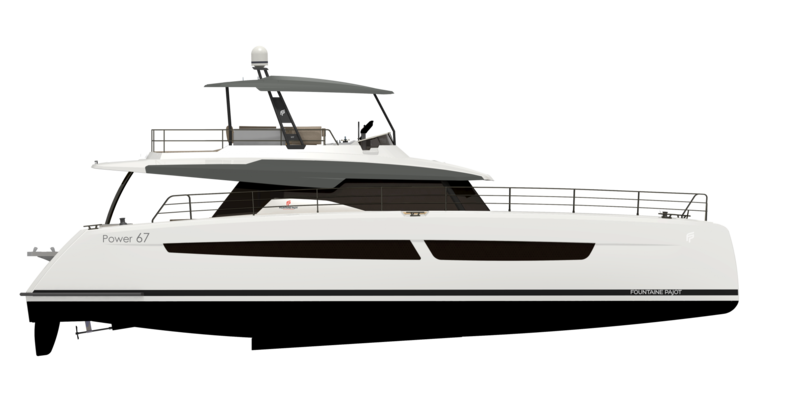 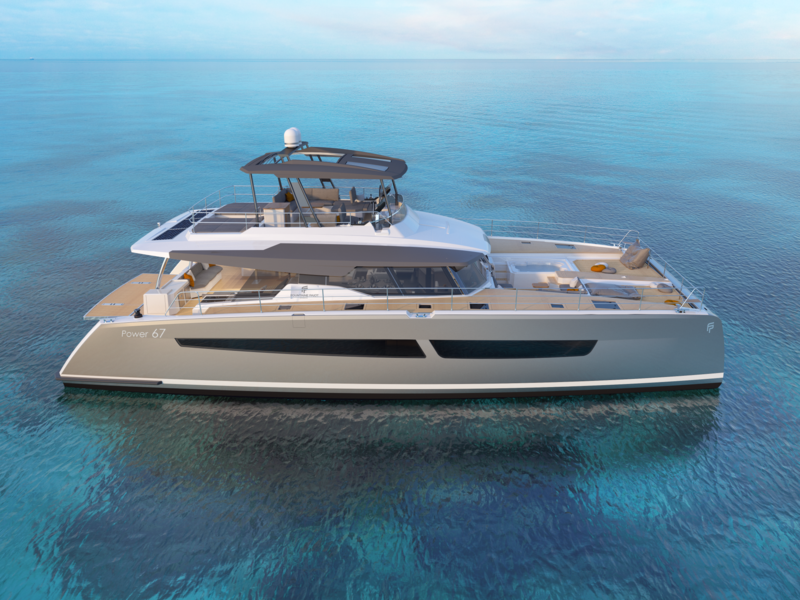 The power catamaran has distinctive slender thoroughbred lines and a contemporary, more rounded asymmetric interior style in keeping with the latest trends. 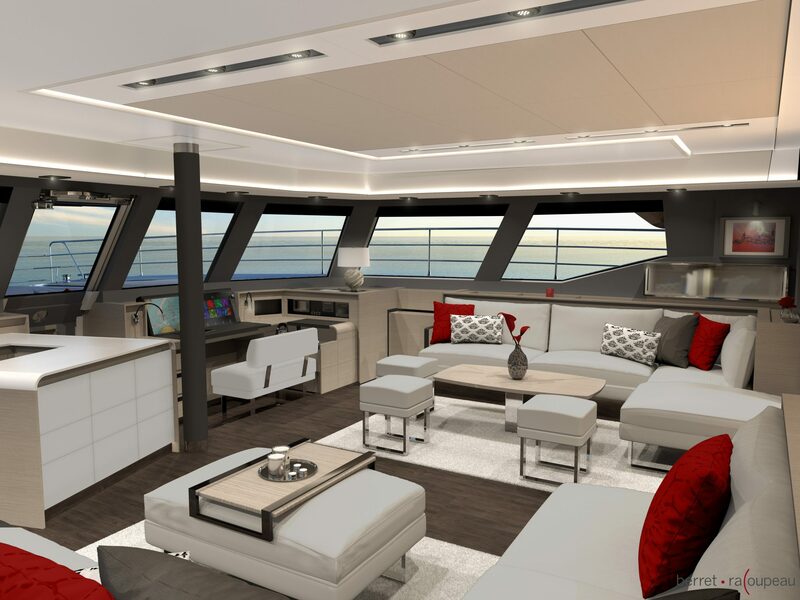 The yacht has been designed with expansive entertaining and relaxation spaces inside and out while assuring uncompromising standards of safety and performance. 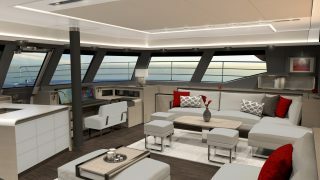 Her 36m² cockpit is designed for unforgettable social occasions, opening fully onto the lounge with several sunbathing spots, a galley with a plancha grill and a dining setting to cater for a large number of guests. 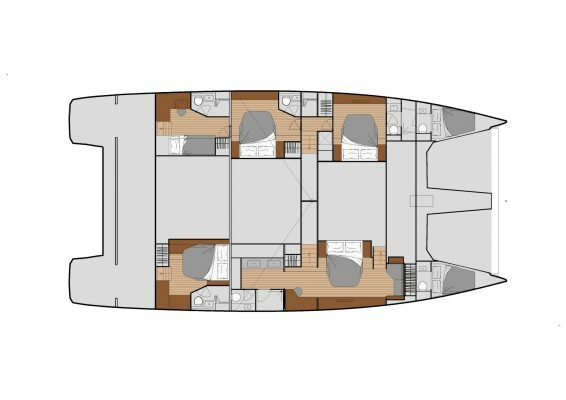 The Power 67’s vast 32m² Flybridge, foredeck with optional Jacuzzi, and Owner suite are simply remarkable and all enjoy direct access from the saloon. 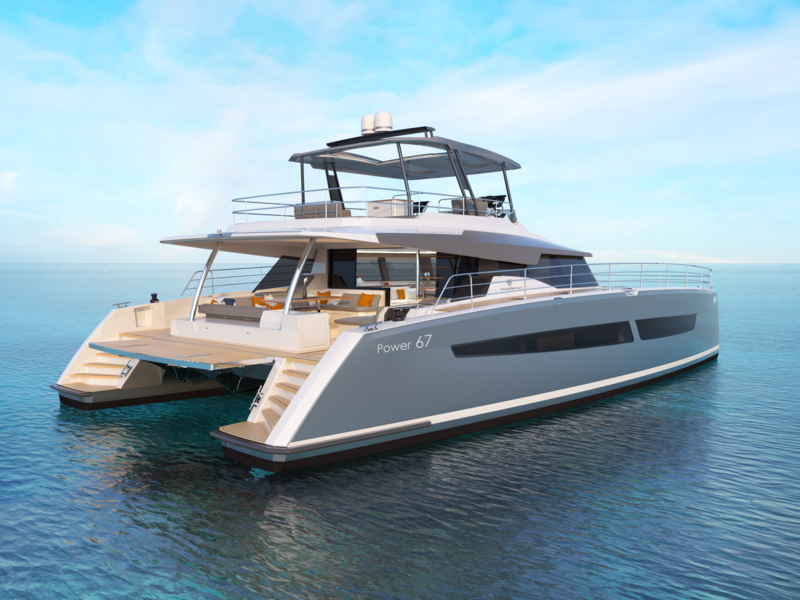 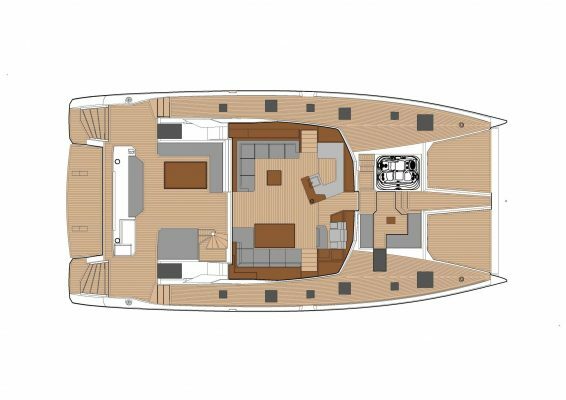 Fountaine Pajot has designed a number of interior layouts for the Power 67 to suit an extensive range of individual needs, including long distance cruises (Long-range cruise catamaran with transatlantic range), the simple desire to enjoy a day out on the water, or even host a special occasion onboard while at anchor. 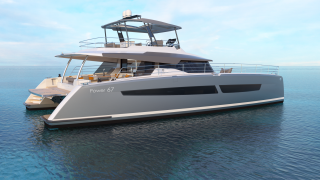 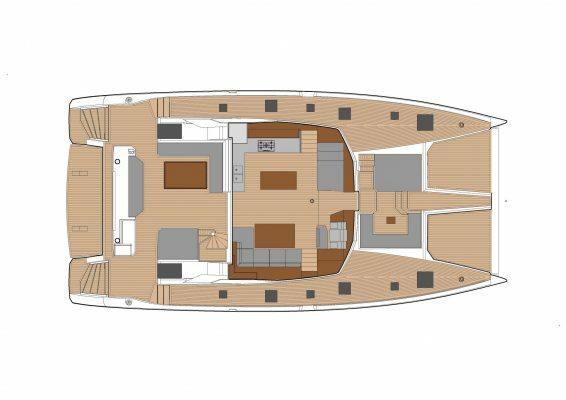 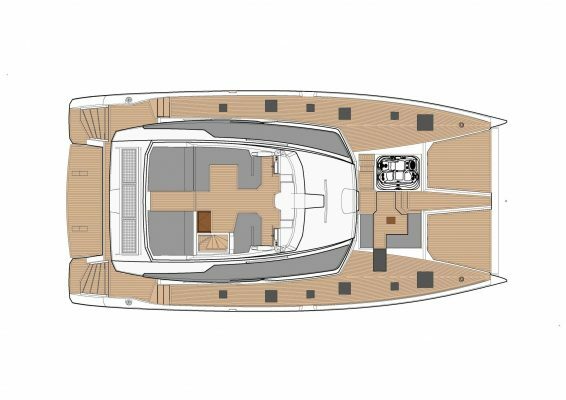 Available in a long galley version or a galley beautifully incorporated into the saloon, the Power 67 delivers generous 5-star luxury space that is bold, modern and eminently stylish. 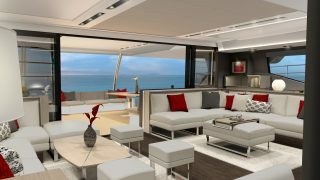 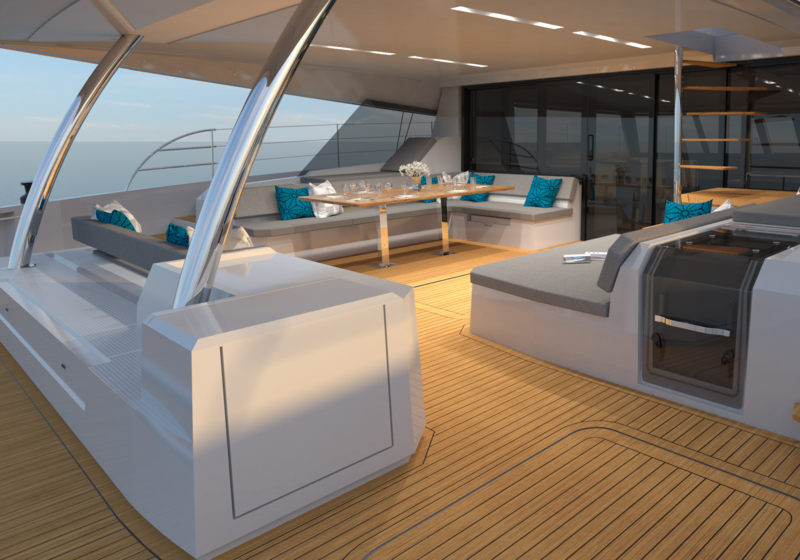 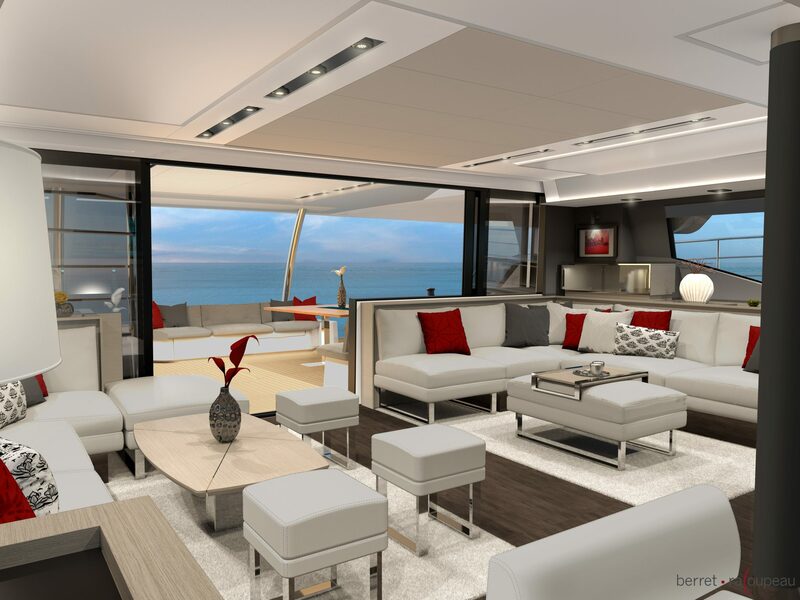 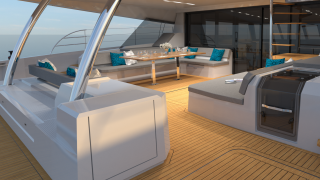 Incredible 360° views are afforded through panoramic windows throughout the power catamaran, and her premium quality design and trims help usher in the natural light and further enhance the serenity and comfort of the living areas. 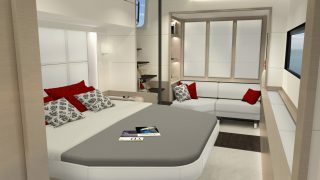 In the Owner’s version, the Power 67 suite is a dedicated 22m² private apartment featuring a capacious dressing room with sofa. 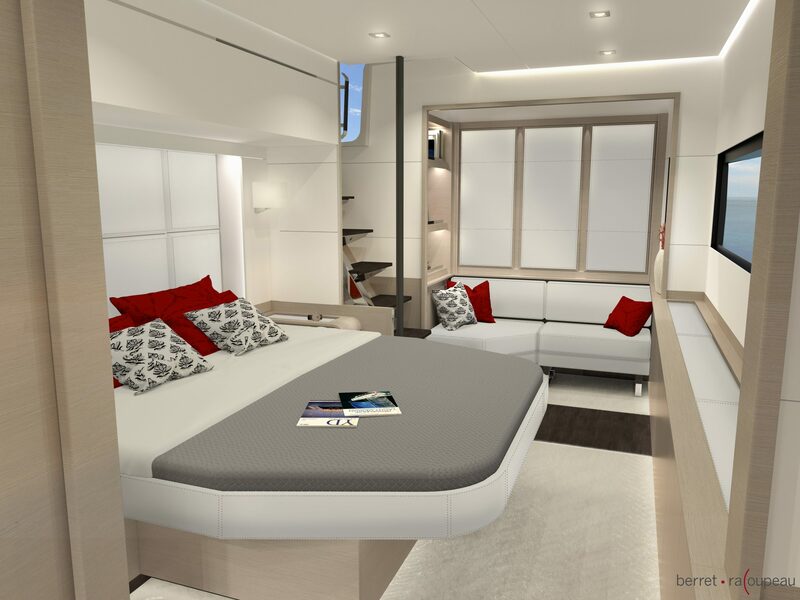 An exclusive door to the front cockpit provides convenient exterior access while retaining privacy, and the Owner’s bathroom epitomizes luxury at sea with a spectacular walk-in shower and designer twin vanities.